Quinoa is one of those foods that you might not have tried before. Once you try it, though, you'll be thrilled to discover that it is quite delicious! And how could something related to spinach and beets not be incredibly good for you? Quinoa is not a grain but the seed of a leafy plant. It has a wonderful delicate flavor and is packed with protein, iron, potassium, and other vitamins and minerals. 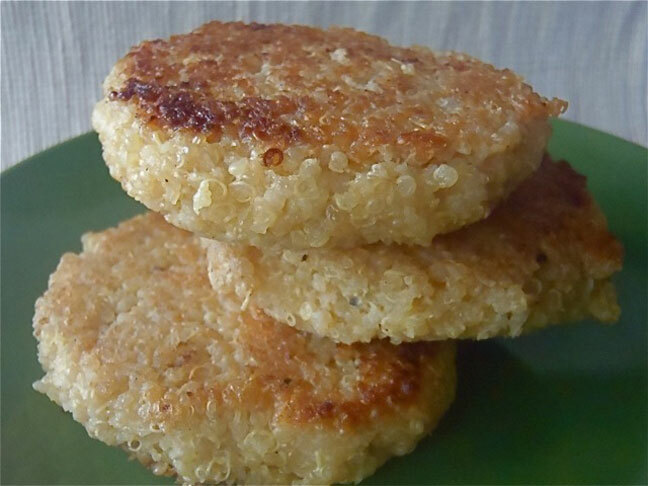 Mixed with cheese, and a couple other ingredients, quinoa can become a fabulous "burger" — one that your kids won't turn down! I serve them with all the fixings: buns, tomato slices, lettuce, mustard, ketchup, and so on. My picky son likes his with ketchup only! Melt the butter with the olive oil in a medium-sized saucepan over medium-low heat. Add the quinoa and cook for about five minutes, stirring periodically, and browning it slightly. Then add the stock or broth and the salt, and bring to a boil. Reduce to a simmer, cover, and cook until all of the liquid is absorbed and the quinoa looks somewhat translucent, about 15 to 20 minutes. Remove from the heat and fold in the cheese. Let the mixture cool slightly, and then add in the egg, mixing it to combine evenly.